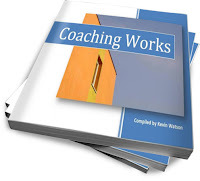 The response was overwhelming and I put a selection of them into an illustrated eBook called Coaching Works, available as a FREE download (click here). It is meant to be a collection for coaches and potential coachees alike, with the hope that it inspires people to take the first step and find out for themselves. As I read it again at the weekend for the first time in a while, I wondered if the same collection of comments could be applied to leadership? Try replacing the original sentence with “As a leader, you know when your leadership is working when...” and let me know if you think the same.